Yet that human factor is what ultimately drives all meaningful change. Strong social entrepreneurs build institutions that help people reach their full potential, be it through relieving immediate needs, solving vexing health challenges, creating beauty and culture or promoting policies and ideas that encourage human flourishing. At DonorsTrust, we’re proud to work with generous donors driven to support all of these efforts. They, as do we, believe in the important role private philanthropy plays connecting all these pieces into a rich tapestry of civic life. Private giving through our donor-advised fund supports public policy think tanks, public interest law firms, and other liberty-advancing groups. But we also grant tens of millions toward education, medical, science, and civic programs that under-gird a robust and free society. Our latest progress report, which you can access here, has some numbers in it. It can’t be helped. The numbers help to tell the story of how 2018 was another record year. Contributions into donor-advised funds here were higher than ever. More importantly, we ended 2018 with $145 million in recommended grants to organizations seeking societal improvement – importantly, doing so without advocating for an increase in the scope and scale of government. Reading through the report, you will note the variety of grantees we work with as well as the fact that our donors continue to be generous and active. This year’s report also adds a new “family” element to our narrative. On the cover we feature some of our clients as part of our new “I Give” campaign. The campaign showcases stories of why our clients give and how DonorsTrust assists them in reaching their charitable goals. Keep a look out for new client stories as the year continues. You can read our most recent feature here. During the next year, you’ll see more of these stories on our blog, as well as such publications as Reason Magazine and National Review. (We’d be delighted to feature you. If you’re interested, please let us know if you would like to be included in this expanding marketing effort). Policy and people are necessarily intertwined. The numbers are important, and, in the case of what we share in this report, something we are proud of. More important, though, are the untold numbers representing those who can live freer, more prosperous lives thanks to the dollars freely given to so many non-profit organizations. Those are the numbers that inspire us, and I imagine inspire you. 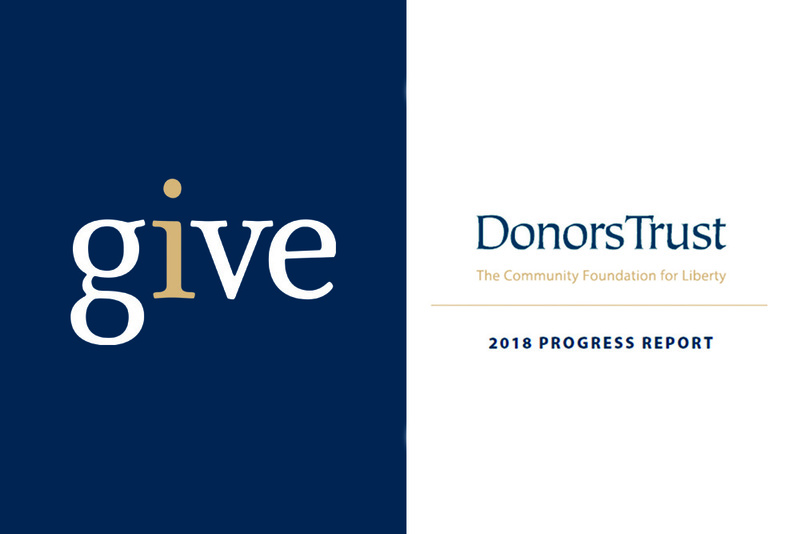 To download your copy of the 2018 DonorsTrust Progress Report, click here. You can also request we mail you a hard copy from that page.